The latrine is a valuable asset in our dig because there is so much we can learn from it and there are exciting artifacts to find. An important part while excavating the latrine is reconstructing the depositional history. The latrine is in an area where there has been little to no disturbance since the Civil War, which means that the objects deposited there back in 1863, when the latrine was in use, are in essentially the exact same spot. Once the latrine was determined to be filled, it was closed with layers of clay and other sediments. We have learned how to pedestal artifacts found in the latrine in order to keep them in place for recording (photographing and mapping). This allows us to know the exact location in which the artifact was found. Mapping is done throughout the days we work in the latrine and also after we have finished excavating each level. And over the last few weeks we have managed to slowly get it down to the forth level. 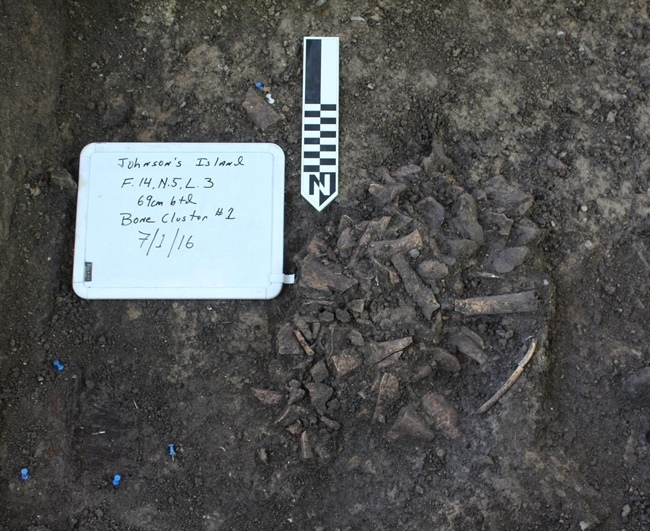 Animal bones, wood, nails, and clay have been the majority of what has been located in the latrine so far. 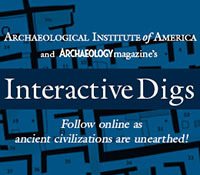 Some interesting pieces found include: prosser and bone buttons, bi-facial projectile point (a Native American tool in the fill of the latrine), a base of an inkwell, and a key. The things we find in a latrine are items that may have been discarded as garbage or may have been dropped and lost. Now, you may ask why is finding wood important? 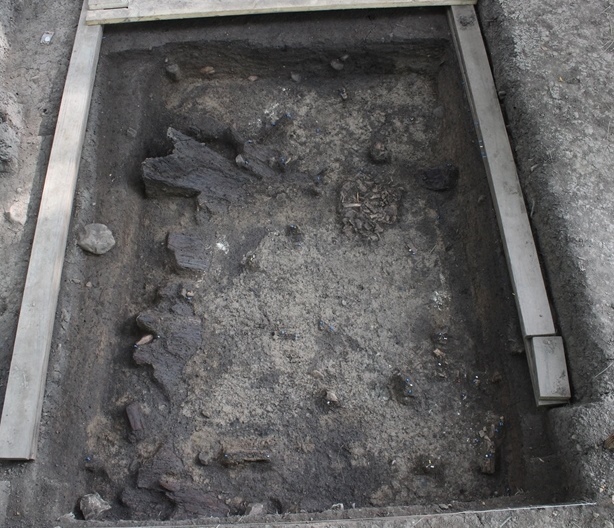 These large slabs of wood could have possibility be remaining pieces used to block the side of the latrine where the prisoners wished to dig a tunnel to escape. 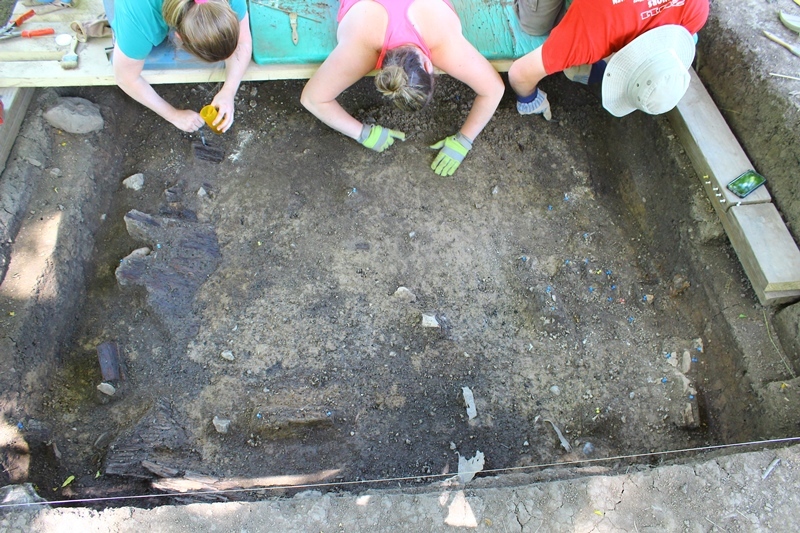 We hope to find more of the wood and other artifacts further down in the latrine. The wood that has been exposed is being treated with PEG in order to keep it from drying out before we can get the entire piece exposed. This latrine, according to Dr. Bush, contains more wood than any other that has been explored at Johnson’s Island. We have also discovered several bone clusters. There are concentrated pockets of bone which seem to represent a one-time disposal from a meal. In 1863 it appears the prisoners were eating well. This entry was posted on Tuesday, July 12, 2016 at 10:37 am	and is filed under Field Reports, From the Students. You can follow any responses to this entry through the RSS 2.0 feed. Both comments and pings are currently closed.